How Do I Know if I Have a Trochanteric Bursitis? The Greater Trochanter is the bony prominence on the upper part of your femur that you feel as the outer part of your hip. Trochanteric bursitis is when the fluid fill sac that cushions that boney area against its surrounding structures gets inflamed. 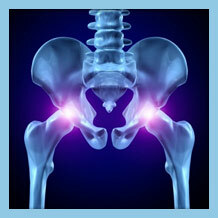 Symptoms include pinpoint pain or pain that encompasses the outer hip. It is often initially a sharp pain but may change to a dull, more extended pain. The discomfort of trochanteric bursitis may get worse when sleeping on the affected side or with walking, climbing and squatting. It is more common in people with curvatures of the spine or that have unequal leg length. Injury and arthritis can also contribute to this condition. Do you have any of these symptoms and think you may be suffering from Trochanteric bursitis? We have a quick and easy tool to help gather some information from you to help us determine what your problem is and get you on the road to recovery. A common treatment for trochanteric bursitis is to start with a conservative approach. Modification in activity, anti-inflammatories, physical therapy and often walking with a cane or walker for a few weeks helps resolve the symptoms. If needed, an arthroscope can be used to perform removal of the inflamed bursa. This procedure has been quite effective in alleviating pain. OLSS provides a wide range of treatment options and because our doctors are the most experienced and best trained in treating Trochanteric bursitis, we are able to perform many advanced treatments other practices may not be able to offer. The real question is: What treatment is best to treat your Trochanteric bursitis? Use our Treatment Check tool to quickly get started in finding the right treatment for you.